← What does Milan Italy have in common with New York? The Amalfi coast is dotted with picturesque hill towns that line the cliffs of the southern side of the Sorrentine Peninsula from Positano to Vietri sul Mare. The area includes the vibrant Vino con Vista towns of Amalfi, Positano and Ravello with sun-kissed vineyards, lemon and olive groves. This is arguably one of the most enchanting coastlines in Italy and offers plenty of Vino con Vista opportunities! Amalfi was the first Maritime Republic before Venice, Genoa and Pisa until King Roger II took over in 1131. The strategic location enabled Amalfi’s military to ward off pirates and invaders. Amalfi was a wealthy trading powerhouse and dominated trade in spices, papermaking and silk. Amalfiwas the name a beautiful nymph loved by Hercules. It is Italy’s oldest Republic founded in 840. The historic center includes the Piazza del Duomo with 57 stairs that lead to the atrium of the cathedral that was built in 987 and dedicated to Saint Andrew the Apostle. Visit the elaborate crypt that holds the relics of St. Andrew, the patron saint of Amalfi. This apostle’s relics came from Constantinople in 1206. He is honored twice a year in Amalfi: on November 30 and June 27 with an elaborate procession. The tympanum boasts a beautiful mosaic by Domenico Morelli showing Christ enthroned. The cathedral was altered in the 18th century to reflect the Baroque style, but traces of the original structure are still apparent inside. Enter the Paradiso Cloister for an outstanding view of the belfry. The cloister was once a cemetery. In the Odyssey, Homer recounted the legend of the Sirens, evil nymphs that lured sailors to their deaths with sweet serenades. There are three privately-owned small islands off the coast of Positano. In Greek mythology, they were called Sirenuse islands because they were believed to be the bodies of the three Sirens. According to legend, the hostile sirens (nymphs) lured sailors with their sweet songs. They were created to protect Aegean sailors from the treachery of the sea by personifying the danger of the seas as sirens. Aegean sailors imagined bodies of Ligea, Leucosia and Partenope, the sirens who committed suicide when Odysseus did not fall for their enchanting songs. Consider a boat excursion to the Emerald Grotto to see incredible stalactites protruding from the marine cave’s ceiling. Plan a visit to Furore, a wine town between Amalfi and Positano where charming murals of Bacchus clutching clusters of grapes decorate the town. Stay and dine at the luxurious Furore Inn Resort with panoramic terraces. 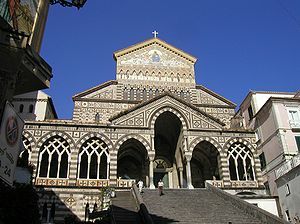 In Amalfi, stroll along the Piazza to Via Lorenzo d’Amalfi to visit the Paper Museum. Learn about the history of some of the first paper mills in Europe. The Valley of the Paper Mills produces high-quality paper. Amatruda is the oldest paper manufacturer in Europe and sells lovely products at its shop. Visit the Torre dello Ziro where Queen Joan of Aragon was imprisoned and later beheaded.